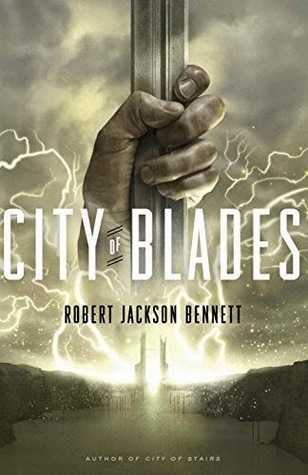 City of Blades takes place five years after the end of the first book in this series, City of Stairs. General Mulaghesh – a side character from the first book – is called out of retirement to do some reconnaissance work in a city that used to be a stronghold of divine war and death. The city’s goddess is most certainly dead, but something is bringing back the nightmare warriors of the past, and it’s up to Mulaghesh to wade through foes both living and dead, human and divine, to stop the mythic end of the world. While City of Blades is set in the same world as City of Stairs, it isn’t a continuation of a storyline. It helps to have read the first book for world-building purposes, but this is its own standalone plot. It’s quite different in many ways from the first book. The narration, for example, belongs primarily to one character rather than having a giant chunk dedicated to other characters and storylines. There’s also less mystery and more thriller aspects. The pacing is more straightforward, with fewer twists. I would say both books were equally good, just different. I look forward to seeing what the third installment will bring, as I know it’s also after a big chunk of time and its own standalone story. Performance: I enjoyed this performance. Alma Cuervo does a fantastic job with all these characters, and this audiobook (unlike the first book) is cleaned up so that you don’t hear any of the mouth and throat noises. This was my least favorite of the three novels, probably because it does the least amount of backstory explaining. The third one does a good job reminding readers what happened in the first two novels, so I was able to read it after having not read the series in over a year. The second one left me a bit lost, and I actually ended up going back and re-reading the first novel again just so I could remember the characters and gods and understand any references to the past. It probably helps that I read them almost back to back, with only a couple books between. I’m not sure if I could say I enjoyed one more than the other. They were both good and like I said very different in so many ways. It helps that I adore Mulaghesh. I loved her as a narrator.